Laura is the Granger Group’s Senior Sales Associate and guides our clients through a vital part of any purchase or sale: the escrow process. She works in partnership with both Linda Granger and Kirk Hawkyard to negotiate escrow items like repairs and credits, advise clients on contingency removal issues, and facilitate the entire transaction from contract acceptance to closing. Having worked in real estate since 1997 and completed nearly 2,000 transactions, Laura’s years of experience and diligence make her an invaluable representative for any buyer or seller. The keys to her great success are enthusiasm, clear communication, attention to detail, and unwavering follow-through on the myriad details that make up a transaction. She is an expert in both the California and Nevada real estate contracts and is equally comfortable negotiating on behalf of clients on both sides of the state line. Laura grew up in Santa Clara and Aptos, and moved to Tahoe in 1990. 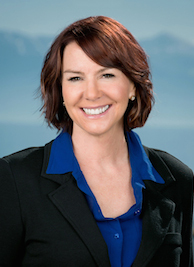 For the last ten years she has lived in Reno and worked in Truckee, Reno and the Tahoe Basin. When not working, she loves to cook, travel, golf, and generally enjoy the outdoors with her husband and son.